Researchers in the US claim to have demonstrated the first small-scale device to perform all the functions required in large-scale ion-based quantum processing. Although the individual stages or groups of stages in quantum computing have been demonstrated previously, this new device is said to perform a complete set of quantum logic operations without significant amounts of information being lost in transit. 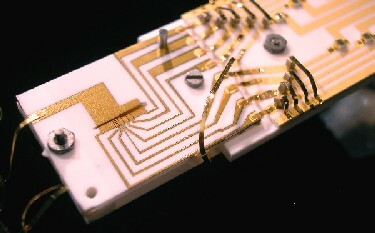 As a result, the device represents an important step in the quest for a practical quantum computer, say the researchers based at the US National Institute of Standards and Technology (NIST) in Boulder, Colorado. Researchers in the field have already hailed this as an important breakthrough in quantum computing. However, they also warn of the practical challenges that still lie ahead if we are to develop large-scale quantum computers. Where conventional computers store data as "bits" with value 1 or 0, in quantum computing data is stored as "qubits" which can hold more than one value at the same time. The upshot of this phenomenon, known as superposition, is that quantum computers could potentially store and process unprecedented amounts of data. What’s more, quantum particles can become "entangled", allowing them to share a much closer relationship than classical mechanics allows in which data is transferred instantaneously between entangled particles regardless of their separation distance. The concept of quantum computing gathered significant momentum in 1994 when the mathematician Peter Shor invented an algorithm to show that quantum computation could factor numbers significantly faster than in classical computation. The implication was that quantum computers could operate at ultra-high speeds, which could be applied to solving complex problems like cracking some of today’s most widely used encryption codes. However, it quickly became apparent that researchers would have a very difficult task of putting this into practice due to the delicate nature of quantum information, particularly when quantum data is being transferred between locations. Despite this limitation, some simple quantum algorithms have been executed in the past few years. Perhaps most notable was the first and only demonstration of Shor's factoring algorithm, using nuclear magnetic resonance, by Lieven Vandersypen and his colleagues at the IBM Almaden Research Center in California. "Home and his team have shown the individual pieces of the puzzle to work separately in a series of beautiful experiments in recent years. Now, in this tour-de-force, they put the pieces of the puzzle together and made them all work in one experiment," Boris Blinov, University of Washington. One promising approach to realizing quantum algorithms is the storage and transfer of quantum data in ultracold ions. This is the approach taken by the group at NIST, led by Jonathan Home, which, over the past few years, has demonstrated all of the steps needed for quantum computation: (1) "initialize" qubits to the desired starting state (0 or 1); (2) store qubit data in ions; (3) perform logic operations on one or two qubits; (4) transfer information between different locations in the processor; and (5) read out qubit results individually. In this latest research, Home’s group have now managed to combine all of these separate stages for the first time. The team held two beryllium atoms in a trap before manipulating the energy states of each ion using an applied ultraviolet laser pulse in order to store quantum data. Electric fields were then used to move the ions across macroscopic distances — up to 960 micrometres — between different zones in the trap. The researchers repeated a sequence of 15 logical operations 3,150 times on each of 16 different starting states and found that the processor worked with an overall accuracy of 94 per cent. One of the key innovations employed by the NIST researchers was to use two partner magnesium ions as "refrigerants" for cooling the beryllium ions as they are being transported. This "sympathetic cooling" enabled logic operations to continue without any additional error due to heating incurred during transport. "We have incorporated transport, and explicitly shown that it does not impede our ability to do further computation — this is a crucial step for building a large-scale device," Home told physicsworld.com. Early response to this development from the research community is positive. "Home and his team have shown the individual pieces of the puzzle to work separately in a series of beautiful experiments in recent years. Now, in this tour-de-force, they put the pieces of the puzzle together and made them all work in one experiment," said Boris Blinov, a quantum computing researcher at the University of Washington. Hans Bachor, a quantum optics specialist at the Australian National University is also impressed. "The work is indeed a great step forward and most impressive — it demonstrates all the key steps required in the computing cycle." Bachor, however, also warns of technical challenges that lie ahead. "The question is whether they can keep the ion in the ground state. I am not aware of any in principle problems, but it will require more tricks to invented," he added. Home told physicsworld.com that his team are continuing to develop their trapped ion system with a focus on two specific problems. The first area is to improve the logic operation accuracy: the accuracies required for a large scale device are 0.9999, where the accuracy in this device is 0.95. "Here we are limited by the control we have over our laser beams, and the power of these beams," he said. The second area is to build larger devices. "Crosstalk between different parts of the processor may be a problem which only exists in larger devices. The classical computer control, and the need for precision control of large numbers of electrodes and laser beams, represents a major technical challenge," he said. Markus Aspelmeyer, a quantum optics researcher at the University of Vienna recognizes another of the challenges involved in scaling up. "It will be a challenge to minimize the individual gate errors and to gain control over a large number of ions on a single chip," he said. Adding, "This is however essential to perform lengthy calculations on a future quantum computer. It is an exciting challenge to both engineering and quantum information science and it is not clear yet where the exact limitations will be." This research was reported in Science Express.